Mason-Dixon conducted a poll for outside groups supporting Marc Elrich’s campaign for Montgomery County executive at the end of September. Beyond predicting the outcome accurately, it indicates that Marc Elrich not only won the election but also a mandate for his development agenda. One of Marc Elrich’s central issues has long been making developers pay more towards the county infrastructure needed to support the expanded population that development brings. Indeed, voters are quite mistrustful of the existing relationship between government and developers. Notwithstanding the endless handwringing by the Washington Post as well as Councilmember Nancy Floreen that Elrich would kill economic growth in Montgomery, voters were far more worried about developer influence than limitations on them. 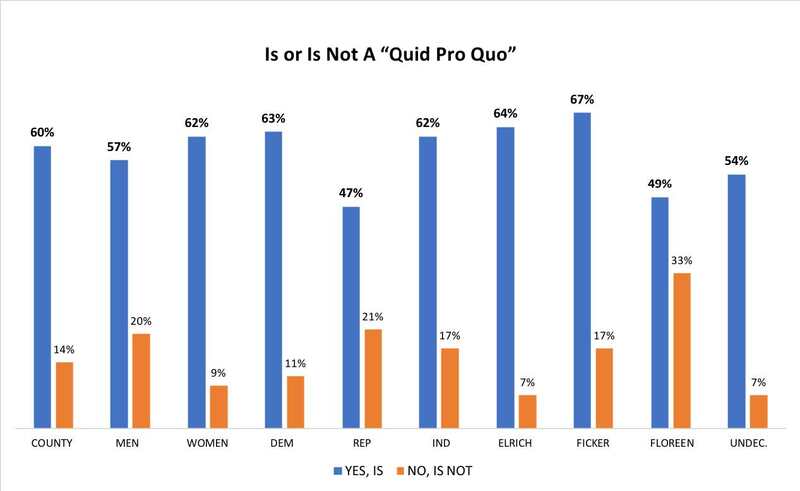 Fully, 60% said there is a quid pro quo compared to just 14% who said there is no and 26% who weren’t sure. As the following graph shows, this is a widely shared belief with far more people thinking that there is a quid pro quo relationship among all groups, including Republicans and supporters of both Nancy Floreen and Robin Ficker. Again, there was wide agreement on this question across gender and party lines with 68% of Republicans and even 56% of Floreen supporters concurring. 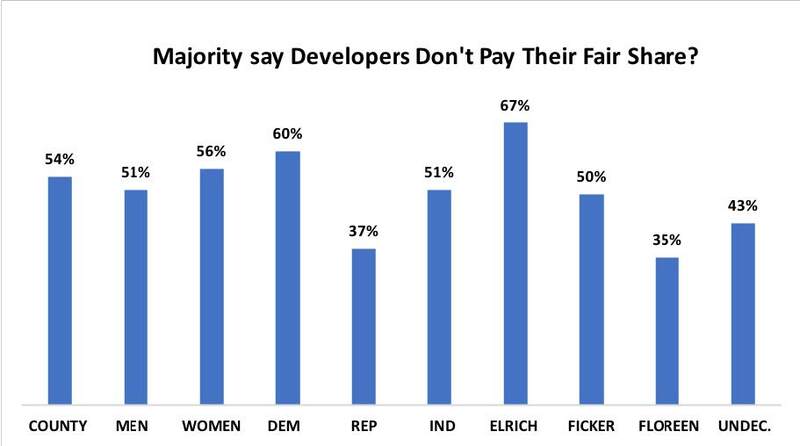 At 67%, Elrich supporters were much more likely to think developers need to pony up more than the 50% of Ficker supporters, and 35% of Floreen supporters. Sixty percent of Democrats agreed as opposed to 51% of independents an just 37% of Republicans. There was also a gender gap with women agreeing 5% more than men. Marc Elrich ran on this issue directly, highlighting it in campaign literature and his campaign commercials. Voters strongly agree with County Executive-Elect Elrich that insufficient infrastructure in a major problem and a majority like the idea of developers kicking in more money to help pay the costs associated with development. People who disagree with Elrich need to ask why they have utterly failed to convince voters. It’s especially striking because incredible sums of money have been spent trying to persuade them otherwise. Even leaving aside the millions spent to support pro-developer candidates in the primary and the general, blogs like Greater Greater Washington, lobbyists, the region’s dominant newspaper, politicians and many others have argued mightily against far less well-funded opponents. One problem is the false narrative about Elrich regarding development. As he regularly points out, there is plenty of buildable space in Montgomery County already under existing Master Plans. He supports higher density and smart growth development centered near transportation. Elrich’s BRT plan will greatly expand development opportunities by easing transportation bottlenecks. It’s a positive sum solution that helps expand economic growth, get people – especially poorer residents – around the county, and helps take cars off the road – good for the environment and traffic. It’s also spending smart because it is just a fraction of the cost of either light rail (e.g. the Purple Line) or heavy rail (e.g. Metro). So maybe it’s time to throw the “Elrich hates development” meme into the bin along with all those campaign flyers. The idea that voters want developers to chip in more for the infrastructure needed to maintain the high quality of life that makes Montgomery County so attractive strikes a majority of voters as utterly reasonable. Here’s a radical thought: if we have more of that infrastructure, then voters would be less likely to oppose additional development.